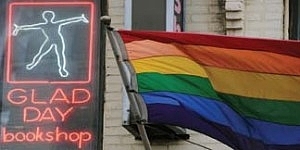 Description: "Glad Day Bookshop is the first Canadian and second longest surviving lesbian and gay bookstore worldwide. Serving the queer community since 1970. We specialize in offering the widest possible selection of lesbian and gay literature, both in and out of print. This in addition to a wide variety of media, including videos, periodicals, music and novelties." Obnoxious staff and hideous atmosphere. at the cash was psycho. I avoid the place like the plague.